Carbon monoxide colorless, odorless, and poisonous gas that claims the lives of more than a hundred people in the United States every year. Not only is CO deadly but even in low concentrations can have a significant effect on your health. Low levels of carbon monoxide can cause headaches, flu like symptoms, and many other health issues. 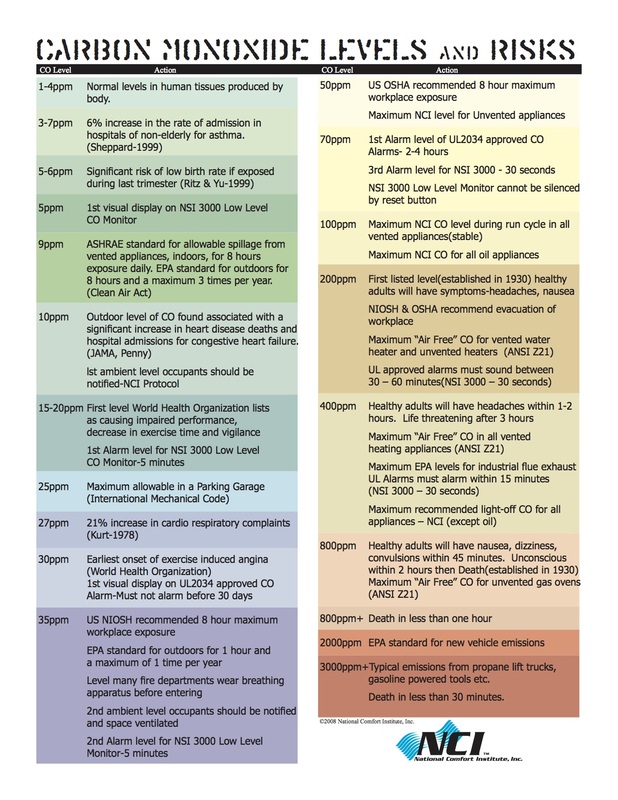 To the right is a chart showing the different levels and risks of carbon monoxide. Carbon monoxide is a natural by-product of burning fuel. The fuel can be propane, natural gas, wood, charcoal, or really anything that produces a flame. In most homes there are many sources of carbon monoxide production. Any gas appliance (furnace, stove, oven, water heater, etc. ), fireplaces (gas or wood), and even your garage can be the cause of carbon monoxide in your home. Remember that every source of combustion will produce carbon monoxide. The key is the amount produced and where it is located. The amount of CO that is produced depends mainly on the efficiency of the combustion, the less efficient the more CO is produced. Take your furnace for example, a good range of CO is 60-90 ppm in the flue gas, but if burners in your furnace are dirty, or the gas pressure isn’t set properly it could easily be producing CO well above 2,000 ppm! Not only is this very dangerous but it is very inefficient. Ideally these flue gases should leave your house via the flue, but that’s not always the case. Flues can become blocked, they can deteriorate over time, and many are just poorly designed and installed. There are also many gas appliances that are not vented at all. Gas ovens, ranges, and vent free fireplaces come to mind. 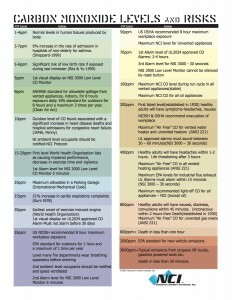 What can be done to reduce the risk of carbon monoxide poisoning? First and foremost, install carbon monoxide detectors in your home. We all realize the importance of smoke d etectors in our home and CO detectors are no different. They can alert you to high levels of CO in your home and may be what saves your or your families life. The down side to these detectors is that a typical carbon monoxide detector doesn’t alarm until concentrations are up to 70 ppm. Fortunately, there are also low level detectors available that will alert you when low levels of CO are present. At B&B, we carry the National Safety Institutes NSI 3000 low level detector which displays CO levels as low as 5 ppm and alerts as low as 15 ppm. 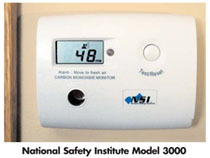 If you are interested in the NSI 300 please call us for more information. Another thing to do is to have your appliances inspected and tested regularly. We recommend having your gas appliances tested yearly by a professional that will perform a complete combustion analysis. This test will show exactly how everything is burning and what adjustments need to be made to ensure safe and efficient operation. Don’t assume that all companies perform this analysis, be sure to ask when scheduling a service call or tune-up. Please take some time to inspect and test your existing CO detector(s) and if you don’t have one please get at least one per floor for your and your families safety. If you have any questions or comments please let us know.